For many people, choosing a Tau army isn't something on their minds. Rather, I get asked by a lot of people why on earth I chose Tau for my Warhammer 40K army. Usually this is because they simply cannot find enthusiasm for the Tau Empire, it's look, feel or background. In fact, one guy told me how the Tau army was boring in every way. He explained how the army had no character, it was boring to play, boring to play against and just how much he disliked the models. Although he did remark on what a lovely job I'd done with the orange stripes. So I thought that now was a good time to explain exactly why I play Tau, what makes the Tau so appealing not as a tactical force to play but as an army with a rich background and a strong theme. Space communists. 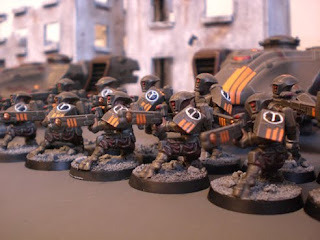 Most people believe that the Tau are communists in space with their Greater Good philosophy (how very democratic of them) with their miniature designs taking inspiration from the Ashigaru for their Firewarriors while Battlesuits are styled like Samurai and Stealth Suits are made to look like high tech ninja. Let's not forget that all their vehicles are named after a kind of fish and each caste is named after an element. The comparison to the Japanese Feudal Period ends and we're plunged quite abruptly into the scattered tale of Games Workshop shoe-horning this new race into the Warhammer 40K universe. In a nutshell, the Tau were discovered by an Adeptus Mechanicus explorer fleet, catalogued and forgotten. The Tau were busy fighting one another much like in the Japanese feudal period. But then the Ethereals appeared, united the Tau race and led them to work together and develop technology at a radical speed. The Imperium returned, came into conflict with the Tau and got their arses shot off. The Xenology book (now out of print) explains how the Eldar genetically engineered the Ethereals to become leaders of the Tau, controlling them with their highly developed scent/musk glands reverse engineered from a Q'orl hive queen. Then of course, we have Commander Farsight breaking away from the Tau Empire and forming his own enclave. This is a reference to Japanese history when Saigo Takamori's Samurai made their last stand against the Meiji government in the Battle of Shiroyama, which formed the historical basis for the movie The Last Samurai. Like many of the armies in Warhammer 40K, the Tau draw on many other influences in the same way that Space Marines could be compared to medieval knights, that Tyranids take some elements of their design from Dinosaurs and how the Orks have been inspired by English football hooligans and Mad Max. I think it's due to these types of cultural references that few people play Tau. This is because few people fall into the right age category. The real inspiration for the Tau comes from the late 80s and early 90s, which means that most 40K players are either too young or too old to truly appreciate the finer influences of the Tau Empire. Please note that this image is taken from Mega Turrican on the Sega Mega Drive. I couldn't get a good photo of the original Turrican on the Commodore 64. Made in 1989, Turrican was developed for the Commodore 64 by Rainbow Arts and ported to other systems later. Turrican was a ground breaking game and bearing in mind that I must have been about 6 years old when I played it, it had a big influence on me. The slogan on the back of the box read "Shoot or Die" and the electronic music by Chris Hülsbeck was just as ground breaking as the game itself. In Turrican you control a lone warrior fighting hordes of mutant creatures and cybernetic monsters and were aided by an advanced suit equipped with powerful weapons. 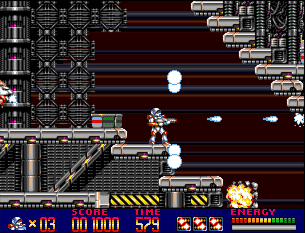 Turrican was a platform game and a shooting game, which meant you jumped around a lot, shot things a lot and had to defeat some of the most ingenious Bosses every devised (or End-Of-Level-Guardians as they were then called). Turrican II followed in 1991 and was every bit as amazing as its predecessor, but with more levels, a jet pack level, ever more ingenious Boss fights and some of the best video game music ever made. Chris Hülsbeck, who created the music for Turrican II is an inspiration to a large number of electronic and industrial musicians even today. 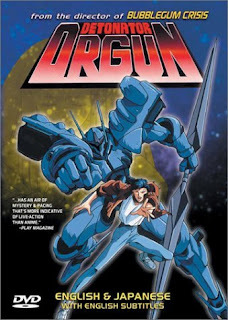 In the mid-90s Anime came to our shores in wave of VHS tapes released by Manga Entertainment with titles like The Guyver, Detonator Orgun, Cyber City Oedo 808 and AKIRA. During a time in which the Sega Mega Drive dominated the video games industry, it was suddenly very clear where so many video game influences had come from, including many of the earlier Commodore 64 games, like Turrican. A lot of people online dislike the Tau, claiming that they're too heavily influenced by modern anime. The irony is, that the Tau are heavily influenced by the early 90s anime, which is a far darker genre. After all, this is what the Japanese took from films like Robocop and ALIENS before mixing it with their own ideas and feeding it back to us. However, there was a consistent theme running through anime, which was the empowerment of technology. The Guyver and Detonator Orgun for example, give us a protagonist with heroic intentions, but either due to their age, class or circumstances they find themselves weak and powerless. But then, they acquire a tank, giant robot or space fighter and are able to fight an alien menace, a mutant horde or an insane computer that's turned the populous into cybernetic zombies and save the day. Much like Turrican really. Stylistically speaking, many of the Tau Battlesuits and vehicle designs hark back to even older anime, borrowing a number of aesthetic elements from Robotech, which began in 1985. I've watched parts of it, and while it's dated quite horribly, the robot designs are quite impressive and clearly show an early inspiration for the Tau Battlesuit. 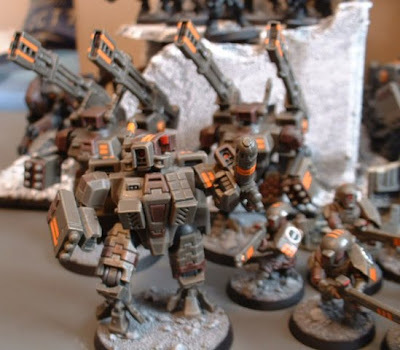 As a guy in his late 20s, the Tau army fills me with visions of Saturday morning adventure cartoons, the video games I grew up playing, 80s-90s anime and feudal Japan. Throw in my own militaristic colourscheme and I've got an army that's rich in character, fun to play and tells a story with every battle. I think that if you're building an army based purely on what Games Workshop gives you, then you won't get the most out of this hobby. You need to find your own inspiration for an army. I'm not saying you should go crazy with conversions or over the top theming. But these are all great ideas to throw into the melting pot, even if they're not clearly represented on your models. Could you tell that all these ideas were incorporated into my army every time I play a game? Of course not. But that doesn't mean your inspirations can't be inside your head. I hope that my article has thrown some light on the inspirations behind the Tau Empire (or my inspirations at least) and will encourage many more people to play them. Good read. I'm not a Tau player and I take a very neutral stance when it comes to Tau. I see the comparison to feudal Japan and while I'm a huge fan of this genera (I was a big time Legend of the Five Rings CCG player, ranking in the top 100 best player in the USA) I still find myself wanting more. To each his own. I just want to say that I'm a fairly new Tau player and your blog has been an invaluable source of entertainment, insperation and education. I love the Tau because they are different and stand out. I love them because they are a Sci-Fi army that actualy shoots the enemy. For the Greater Good. We fight on. I like Tau because they are, quite frankly, the most unique race in 40K. Their appearance is totally different. Their racial philosophy is absolutely unique. The playstyle of the army on the table is also one-of-a-kind. As you point out, the Tau are the only non-Western-themed/-inspired race in the entire game. What's not cool about that? 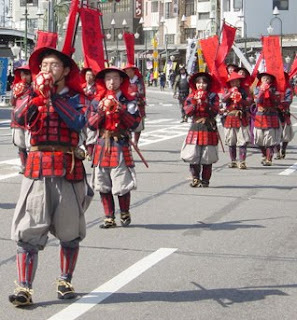 I too love the Japanese cultural influences so apparent in the army design and background. Unlike everybody else, the Tau actually look forward. They intend to make their way in a universe that absolutely hates them. They're a little plucky, that is. In the grim darkness of the far future, how can you not admire that, even just a little bit? Huh. I actually find it strange that not more people like the Tau. Personally, I love every aspect of them. The culture, their attitude towards technology and war. I love their vehicle designs and battlesuits. Even the FWs and drones are nice. I absolutely love the kroot! They have quite a few things the other races don't have, chiefly: optimism. They are energetically expanding. Not merely fighting for survival or dying out or just rampaging and devouring. They happily incorporate other races who accept the Tau rule. They don't force their beliefs on other races. They aren't xenophobic. They are not superstitious about their tech. They value life in general, not just their own. They are practically the only race that's not living in a depressing dystopia or dying world / craftworld. In other words, the Tau are a breath of fresh air. I played SM in 1st and 2nd ed. I left 40k for a long while. I would never have returned to 40k (4th ed) if not for the Tau and Kroot! Great article. I've loved Warhammer 40k since I picked up the Advanced Space Crusade White Dwarf (#131 I think?) years and years ago. Everything that you mention here is spot-on, but the other thing that I like about the Tau, apart from their ubertechiness, is that they have hope. I love Marines, they were my first force way back when, and I love everything about them. Their struggle at the frontlines to keep the slowly dying Imperium from being torn asunder, their iron-grip on extremely limited tech, the way that they were like the pinnicle of everything that the best humans could hope to be and on top of that it was all cemented together by a millennia of religious dogma to keep them true. Whereas the Tau are a mirror. Ever evolving hi-tech (no, not the trainers) in abundance, a solid unity born from the drive to survive and expand rather than a brutal religious regime out of necessity. Their ever expanding Empire as opposed to a slowly decaying Imperium, their embracing of other races capabilities to compliment their own, their clear-eyed hope to become everything that they can be nd their drive to be what they wish to be. I'm a massive fan of both the Astartes and the Tau, but the Tau edge it out for me - gotta love the up and coming under-dog. Shi. I signed on with the Tau for their freshness. I admit to fitting the mid-20's section you've got who grew up with anime and mecha, and spend way too much spare time playing the Armored Core series (and have just about all those, all the Mechwarriors, and so on...). The Japanese references are not lost on me, though I hadn't really assembled all the components of the knowledge as you have here. They've got REAL mech suits, plasma that doesn't blow up, rail guns, smart missiles, ECM that makes a difference...what's not to love? For me, it's more the optimism. I'm not entirely sure you could call them communists; I would say it's merely a much more collectivist culture. I mean, America (my home nation) is pretty much on the far side of the individualism end of the spectrum. I > Us. China, I believe, holds on to the opposite end of Us > I. One thing you get with a collectivist culture is a very "Us vs. Them" distinction. It's a concept of my group vs. other groups. To be honest, it's a lot of what you see over in the Middle East and parts of Africa, for example. Except the Tau don't direct hatred on outsiders. the Imperium really IS brutally morbid and hateful towards outsiders (and let's be honest, there are four types of people in the Imperium: Alien, Mutant, Heretic, and One Of the Above But We're Not SUre Which Yet). The Tau...look down on outsiders for not seeing it their way, but seem a little bit slower to just blast you. Other than the pheremonal control (and perhaps the Vespid helmet which seems to be implied mind control) the Tau are pretty much the only good guy in the 40k universe. I mean, if I went to the 40k universe, I'd ask to move in with the Tau if that tells you anything. And theme-wise, there's still room for customization. I mean, it's not as bad as the Necrons which, when you get down to it, are pretty much techno-zombies with a techno-lich leading them. Not a whole lot you can do with that. 'Nids? Color scheme and neat conversions, but there's no variation in personality to them. I think giving the Tau a chance is a great idea for folks, plus, well, rail guns and plasma. 'nuff said. For me, the Tau represented the first step towards making 40k a clearly sci-fi game, rather than Fantasy in space, which it still kind of is, but when you play Tau you are firmly set in the far futre, rather than some mix of past and future that is reserved for armies like space marines and guard. Also, I am so glad you decided not delve into an explanation of why Tau are communists because to anyone who is familiar with communism, this is completely false. Communists don't have caste systems, everyone is equal(or in reality, everyone is poor). I think Tau fluff needs to be developed a bit more. There needs to be more literature and novels. I would surely read those! On the topic of people not liking Tau, I just don't get it sometimes. I was playing a guy at a tourney and he kept repeating "I hate Tau" over and over. Needless to say I knocked his sportsmanship score for that, but I realized why he hated them. Because Tau don't play in the same style as most of the other armies, where people are expecting a slug fest in close combat. We're more graceful in my opinion...anyway, this comment is getting too long. I too as a Tau player sometimes get the question of "Why the Tau?" 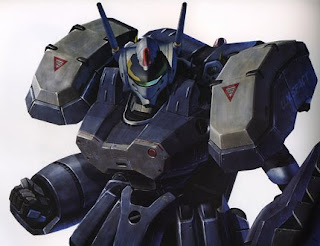 For me it was the sense of hope and idealism that motivated the race, as well as the awesome looking battlesuits. I was suprised to read the truth of the Ethereals origins, but it is also very cool as it expands the possibilities for future stories, what would the Tau do if they learned the truth? Would they rise up and join farsight, or take a more enlightend path towards the dream they've worked so hard for? I really enjoy playing Tau, and I found this article to be really informative. Man, this was great. Thanx Adam. And hearing from a few others who love the Tau-silly little blue fishmen that they are-as much as I do. Funny thing is- I've TRIED to build and play other armies. I almost proxied a Space Marine army once. Once. I actually own a bunch of Space Marine stuff. Someday I may put it together, even. Someday. But I stuck with them. And now I'm hooked. This blog actually got me enthused about them again just as I was losing faith. I sent Adam a thanx E-mail as a matter of fact. I'll never give my little blue fishmen up! For the Greater Good! Forever! Excellent summary. I joined the Empire based on the background: a fledgling empire that luckily avoided being wiped out before it even got started with a massive grasp on technology. As a Physics geek, that technology part was really what did it in for me; when I saw the models, they were just extra cement. I'm kind of glad that there aren't that many Tau armies out there... It mimics the actuality of the fluff, plus I wouldn't want to play against Tau every other game, right? As a few of the fine folks here have stated before I think the big draw for me is of course growing up with anime and video games ( heh I fit mid to late 20s demographic as well) However if I was to pick a down and out 100% reason why i decided to pick Tau as my primary army, It boils down to that the fire caste are for me the cooliest looking basic infantry in the 40k universe and the fact that the models themselves are so dynamic looking. with the exception of one of the leg options all the rest of them look like they are in a state of motion of some sort. They also look so different from the other races that ( as far as I can tell they also dont have any sort of WH fantasy counter part as many of the others do) I couldn't help but dig them. The battle suits are also cool with the weapon designs and the model itself looking like it would be able to zip around the battle field and unleash hell compared to the squat tank on legs of the imperium ( dreadnaughts) . Great article and great blog, I love you articles on both gaming and modeling. I'm interested in the Tau army due to the manga connection, namely Robotech which I loved watching as a kid. I was also big into the Battletech tabletop game, which spun off into the Mechwarrior franchise that's still somewhat popular today. It's fun to tap into that nostalgia while modeling, painting and playing my 40k army. Thanks again for your continued interest and input with the blog. Impressive article! I think everyone has just about summed up my thoughts as well. I'm looking forward to visiting your blog on a regular basis. Makes me want to start a Tau army. The concept of the "Greater Good" is an obvious reference to a propaganda the Japanese Empire used during the late 1930's and World War II which was called "Greater East Asia Co-Prosperity Sphere". Similarly, Asian countries that accepted this were imbibed by the empire via puppet governments and those who stood up against this met very terrible consequences. Although I do enjoy the Tau and I think they were greatly designed from story to figures. I still think they are no exception in a universe ruled by black and gray. They are supposedly a young race maybe that relates to their optimism brought upon by rapid cultural and technological progression compared to their darker past. I was has looking around at my local store, looking for an army to play.I didnt find anything that intersting to me,until I came across a box of fire warriors. From then on it had to be Tau. I love the Tau with there background and looks. I am thinking of starting Warhmmer 40k but I need a colour scheme First. Any ideas. Thanks. I got into Tau exactly because of its influences. I grew up watching mecha anime, dreaming to be a ninja and I'm an Asian whose grandparents lived through the brutal Japanese Occupation and its concept of the East Asia Co-Prosperity Sphere. Also, I figured a sci-fi army should be shooting futuristic weapons and should only wage in close combat as a last resort (or if you're a beastly race like the Tyranids). The army hits all the right chords. Looking forward to the new battlesuit designs. Honestly for me, what got me into the Tau was mechs plain and simple. Not the stories, the fluff, none of that. I had to have me an army of those battle suits. I did read and enjoy the fluff but for me it was seeing my friend run them and go HOLY **** those mechs are awesome. And while sometimes I win and more often I lose. I always have a blast playing my Tau. Their models just capture my imagnation the way no other army has. The tau really stuck for me, they favor long range over cc, which is much easier in my opinion. Their story is much more in depth. They just seem more... Human. The humans try to kill everything, whereas tau want to integrate everyone into their civilization. They accept civs for who they are. Personally i choose tau. Plus you can alter firewarriors heads to show the different races in the empire! I actually have a few skaven FW's along with some humans. Plus there much better at sprint, blow away, sprint. Fits my tactics well. For me the biggest source for the Tau are the Nabari from Farscape, they are "invented" two years before, have advanced technology, keep saying "for the greater good", have a active rebellion and most importantly are flecking blue.